Highly endangered, we searched the preserves of South Africa in hopes of sighting this illusive creature. Not to be confused with hyenas, the Wild Dogs are a distinct species of their own. 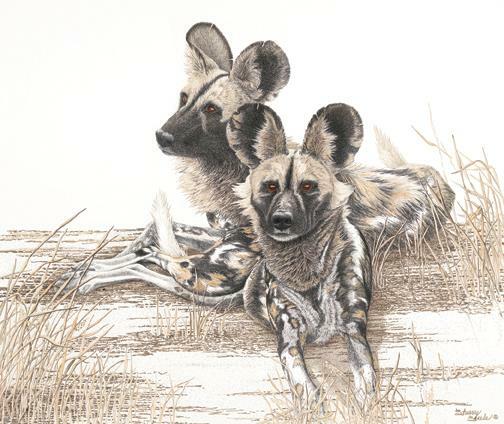 One of Africa’s most efficient predators, their trademark coloration, white-tipped tails and ‘Mickey Mouse’ ears make them a perfect subject for my pens and inks. Caught in a rare moment of quiet, this alpha pair has paused to share the bond of affection and responsibility. A high intelligence is clearly evident in their piercing eyes.